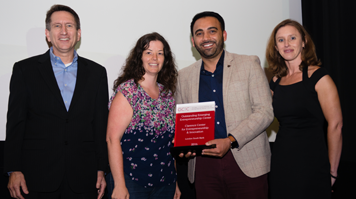 The award for Outstanding Emerging Entrepreneurship Centre was presented to London South Bank University (LSBU) at the Global Consortium of Entrepreneurship Centres (GCEC) Conference 2016 in Rochester, USA. This significant achievement celebrates LSBU's commitment to supporting students and graduates to develop their enterprise skills, and recognises the Clarence Centre for Enterprise and Innovation as a central hub for this activity across campus. “Winning this award marks an important step in our mission to become the top modern university in London. “Last year we supported 60 start-up ventures and engaged over 5,000 students and graduates in enterprise activities. Through our interactive workshops and start-up programmes we continue to drive our University community to create and develop new ideas. The Clarence Centre provides a unique environment for LSBU students and alumni entrepreneurs to work alongside SME tenants, offering opportunities for skill development and start-up support. Over 600 local SMEs have gained access to funding opportunities, consultancy services and one-to-one support. In the Business Solutions Centre LSBU students provide a free drop-in advice service for local businesses, enabling them to apply their learning to solve real-world problems. Our 65 SME tenants based in the Clarence Centre benefit from furnished offices, discounted meeting room space and access to established networks. Find out more about the Clarence Centre for Enterprise and Innovation.